The finest obtainable Colonial Era map of the Gulf Coast around the Mississippi Delta and Louisiana. A flawless example of an extraordinary and important 1732/52 map of the Gulf coast and lower Mississippi River Valley by Jean Baptiste Bourguignon d'Anville. 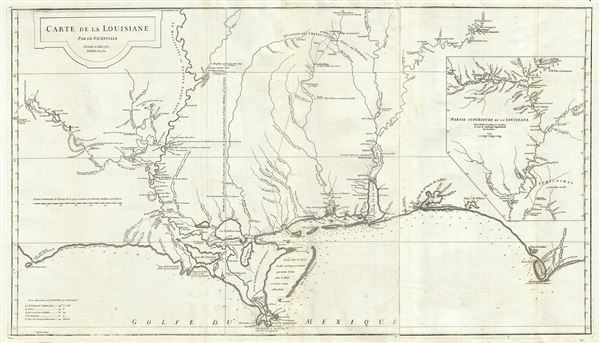 D'Anville's map covers from Sabine Pass (Cabo del Norte), Texas, past the Mississippi River Delta, Mobile Bay, and Pensacola Bay, to Saint Joseph Bay (Baye de St. Joseph) and Cabo Escondido (Cape San Blas), Florida. The map extends northwards along the Mississippi River as far as, roughly, Lake Providence, and northwards along the Alabama River (Riviere des Alibamons) as far as Fort Toulouse (modern day Wetumpka, Alabama). An inset in the upper right quadrant focuses on the upper Mississippi River Valley and includes much of the lower Missouri River as far as the Kansas River (Kansaz). The map offers minimal topography, as little was known, but does follow the river courses, including the lower Mississippi, the Red, the Osage, and the lower Missouri, in some detail and presents numerous depth soundings along the Gulf Coast and in the adjacent Bays. Cartographically much of the coastal information presented here is derived from manuscript work compiled by French Royal Engineer Valentin Devin between 1720 and 1732. Devin's work was incorporated into this map, as well as into others by competing French cartographers Philippe Buache, Nicholas Bellin, and Guillaume De L'Isle. Another Royal Engineer, Ignace Francois Broutin, is responsible for much of the inland cartography, particularly around Natchitoches and Natchez. Historically speaking, D'Anville drew this map following the 1730 French siege and subsequent destruction of the Grand Village of Natchez. The attack was a retaliatory move on the part of the French following the 1728 Natchez Massacre, in which 229 French colonists who had settled nearby Fort Rosalie (depicted) were slain. The war ultimately dispersed the once powerful Natchez Nation. Many were subsequently absorbed by the Creek and Chickasaw. Natchez itself re-emerged as a European trading center on the Mississippi. Anville's map is most richly detailed along the Mississippi River, especially the lower Mississippi in the vicinity of New Orleans, on which the map is loosely centered. Throughout this region numerous towns and villages, both European and American Indian are identified as well as fortifications, both actively occupied and abandoned. There are some depth soundings apparent in Lake Pontchartrain. The Chandeleur Sound is noted as having many little known islands. The mouth of the Mississippi, with its complex network of channels, is, for the period, well mapped. The map extends westward along the Red River (Riviere Rouge) as far as Tecas (Texas), the limit of French dominion. Here the French Fort of Natchitoches stands buy seven leagues from the Spanish Presidio de San Miguel Arcangel de Linares de Adayes, identified here as simply 'Adayes' . The map extends westward along the Red River (Riviere Rouge) as far as Tecas (Texas), the limit of French dominion. Here the French Fort of Natchitoches stands buy seven leagues from the Spanish Presidio de San Miguel Arcangel de Linares de Adayes, identified here as simply 'Adayes' . It is not without significance that Anville breaks the border of the map to include the Presidio, for just at it is outside the printed ken of this map, it is also beyond the boundaries of French influence. The cartography for this region is extracted from Ignace Francois Broutin's Map of 1722. At the opposite extreme of the map is Fort Toulouse (For des Alibamons or Alabama Fort) at the conjunction of the Coosa and Tallapoosa Rivers, in the country from the Alibamons (from which the state name Alabama is derived). The French established Fort Toulouse in 1717 as a bastion against English incursion into French territory. Records suggest that the Alabama Indians invited the French, who they perceived as the lesser of two evils, into this region during the 1715-1717 Yamasee War. The Yamasee War was fought between English settlers in South Carolina and various American Indian Nations. The French abandoned Fort Toulouse in 1763. The inset map in the upper right quadrant, though small compared to the rest of the map is significant in that it offers an interesting perspective on the Upper Mississippi and Lower Missouri Rivers. Here Anville has confused the Ohio and Wabash Rivers, presenting them as a single river - a error that D'Anville would correct in his later map Amerique Septentrionale. Nonetheless, this map was most likely among those consulted by Meriwether Lewis and William Clark in preparation for their expedition. Thomas Jefferson is known to have acquired seven maps by D'Anville in 1787, among which this map was almost certainly included. In a subsequent letter to Secretary of Treasury Albert Gallatin regarding a newly commissioned map of North America, Jefferson obliquely referenced this map when he suggested using D'Anville as a reference for the Lower Mississippi Basin. This map must also have been consulted by Meriwether Lewis in preparation for the historic Lewis and Clark Expedition up the Missouri River. Though drawn in 1732 and not issued until 1752, 20 years later, D'Anville's Louisiane was among the best and most detailed available large format maps of this region well into the early 19th century. The map was engraved by Guillaume de la Haye. It was issued in various made-to-order atlases and remained popular due to its accuracy for over 50 years. It is noteworthy that this map is in extraordinary condition and by far the finest example we have seen anywhere in any collection, public or private. If you are a collector who demands flawless or near flawless examples in their acquisitions, this is an opportunity not to be missed. Very good, near flawless example. Original fold lines. Pressmark visible. Blank on verso. Minor wormholes bottom center. Rumsey 2603.037. Osmon, Rick, The Graves of the Golden Bear: Ancient Fortresses and Monuments of the Ohio, p. 27-29. Jackson, J., Flags Along the Coast : Charting the Gulf of Mexico, 1519-1759: a Reappraisal, p.94. Lowery #333. Phillips (Atlases) 571-35. Riley, Franklin Lafayette, Publications of the Mississippi Historical Society, Volume 6, p. 405. Halbert, H. S., Publications of the Mississippi Historical Society, Volume 3, p. 367-371. Taliaferro, H., Cartographic Sources in the Rosenberg Library, 141. Lowery, W., The Lowery Collection, 333.